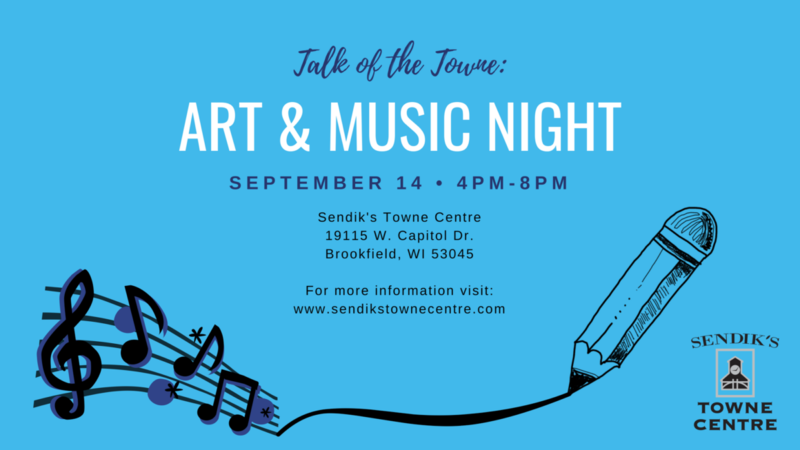 Join us for a night of culture and sweet sounds as Sendik’s Towne Centre welcomes local artists and musicians to display their talents! Art of all kinds will be displayed in empty storefronts and will be provided by students from local high schools and colleges, as well as artists from other organizations. As you walk around to the various shops around the Centre and take in the beautiful works of art, a variety of acoustic musicians will be playing in different areas of the Centre. Come take in the sounds of local musicians with a wide range of musical genres! Absolute Pilates, LLC – Join us for free pilates demonstrations, promotions, drawings, and learn more about us at our information table. Come learn pilates! Brunch – Join us for an outdoor grill-out of burgers, brats, and chicken sandwiches. We will also have yard games and a Brunch raffle! Café Manna – Stop by and enjoy half-off bottles of wine! Callen Construction – Come take a look at our wide variety of products and services. We are also holding product demos inside the store as well as a Marvin windows giveaway! Mathnasium – Math is everywhere, especially in art and music. Come experience it all while you enjoy our balloon artist, free month membership raffle, and other fun prizes! Milwaukee Ballet Academy – Our dancers are excited to meet and greet you as you enter Sendik’s Fine Foods! Make sure to stop by our tent for information about classes and our upcoming season. Sendik’s Fine Foods – We are excited to offer samples of our wide variety of wine as well as beer samples from Waukesha brewery, Raised Grain! Be on the lookout for our raffles, as well. Squire Fine Men’s Apparel – Today only, stop by to receive 25% off any regularly priced tie in the store. Also, register to win a FREE tuxedo rental, valued at $135-185, no purchase necessary! (Disclaimer: Tuxedo must be rented prior to January 1, 2019). This event is open to everyone, young and old, and is completely free. Plus, as you make your way around to different vendors while checking out the art and music, you will have the opportunity to collect stickers for your chance to win a raffle prize! Stop in anytime from 4pm-8pm on Friday, September 14 to take part in this night of art and music. It will be one you won’t want to miss!